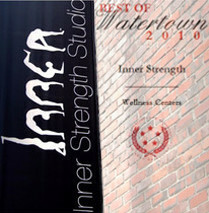 If you are a fitness enthusiast looking for a great workout or an avid yogi long-timer seeking a new yoga studio home (AND you don’t mind sweating up a storm while burning crazy calories as you stretch and tone), you may want to check out Inner Strepowerngth Yoga in Watertown, Ma for a deeply satisfying, full immersion, mind-body fitness experience. Let the products speak for themselves. At inner strength, I implore you to find anything but thin, fit, and toned long-timers among your midst. Although I am quite the yoga snob, I would swear by Inner Strength for a daily hot power yoga practice after many years dabbling in numerous forms of fitness activities and a variety of yoga styles and studios. Although at $17 per class or $180 per monthly unlimited it is a couple bucks more than its most comparable and proximal local competitor (Prana Power Yoga), quite frankly, with a higher caliber of teachers and a more calming, pleasant, and spiritual ambiance, you definitely get your money’s worth. Inner Strength Yoga teachers are the real deal and the workout is intense. Although this hot power yoga style is not for the faint of heart (literally or figuratively), anyone who is interested in combining fitness, spiritual development, and mental relaxation into one power packed 60, 75, or 90 minute session will enjoy a class at Inner Strength. This yoga style is geared toward beginners and advanced yogis alike and offers a blend of spiritual insight, mental relaxation, and physical release. Inner Strength offers a dim lit, aromatic, atmosphere, a charming selection of yoga clothing for purchase, and a few ancillary services such as: Personal Training, Massage and Eastern Sun Acupuncture. While Inner Strength Yoga offers fewer classes per day than Prana Power Yoga or Baptiste Power Yoga (comparable hot power yoga studios in proximity, price, and style), I have decided to make my health, fitness, and well-being a priority by planning my day around a higher quality class in a soothing setting at Inner Strength. Also to note, if you are interested in achieving your RYT 200 Registered Yoga Teacher – 200 hours), Inner Strength Yoga is an RYS 200 offering yoga teacher training. As far as local power yoga studio teacher trainings go, this would be my first choice for yoga teacher training if I were not already a certified hot power yoga instructor. To sum up, if you are looking for cost savings or a gentle stretch, look elsewhere. On the other hand, for a sweaty workout, clear mind, fit body, and an overall meditative experience, Inner Strength may be the place for you!